Priorities for easing traffic congestion in Bath and across the West of England to support economic growth will come under scrutiny at a major conference next week. The West of England Public Transport Summit & Debate aims to influence thinking on the issue – one of the most pressing for firms across the region and a significant brake on business growth. Business West, the region’s largest business representation group and the organisation that runs Bath Chamber of Commerce, will present the findings of a study among its members which will help shape the debate around the region’s public transport system so that it delivers for the business community. The findings will be presented by Business West’s James Durie, who will be joined by speakers including First West of England managing director James Freeman, GWR commercial development director Matthew Golton, West of England Combined Authority director of infrastructure David Carter, Mayor of Bristol Marvin Rees and Bristol Airport planning and sustainability director Simon Earles. Chief Executive of London Chamber of Commerce Colin Stanbridge will also speak on the role of the business community in making the case for investment in the public transport system drawing on the experience in the capital. Chairing the event will be Nigel Stevens, formerly CEO UK & Ireland of Transdev, one of the largest public transport operators in Europe. James Durie said: “Heightening congestion on our roads poses one of the biggest threats to the fortunes of the region’s businesses and economy. “Future job creation and housebuilding to accommodate the growth needs of the regional economy, together with an increased number of commuters from Wales following the Severn Bridge toll charges coming to an end, will put greater strain on an already under pressure transport infrastructure in the West of England, with implications for employees and their employers. 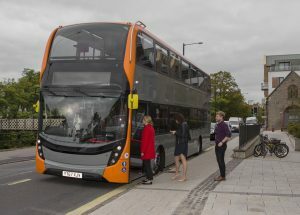 First West of England Managing Director James Freeman added: “We have started to make real progress particularly with the arrival of the £230m rapid transit Metrobus service, (pictured) where there is already significant evidence of behavioural change with people leaving their cars behind and taking public transport into and around the city. The event will also include a panel debate involving public transport operators, the business community and developers. Panellists will include First West of England commercial director Rob Pymm, Bristol is Open managing director Julie Snell, Enterprise Holdings head of policy James Lancaster, Sustrans head of partnerships Jon Usher, Kevin Gibbs, senior counsel, planning & infrastructure at law firm Womble Bond Dickinson, and Ann O’Driscoll, director of North Bristol SusCom, which represents major employers in the area. The event, which takes place at SS Great Britain, is being organised by Business West.